Should You Use The HP Universal Print Driver or Other Third-Party Print Drivers In XenApp 6? One of the problems that has plagued Citrix admins and engineers has been third party print drivers. All it takes is for one bad print driver to misbehave, crash the print spooler, and generate dozens of support calls from users who suddenly cannot print. This common problem led to Citrix including the Citrix Universal Print Driver (Citrix UPD) which is compatible with many popular printers, and is much easier on the Windows print spooler. In cases where the Citrix Universal Print Driver does not play well with an application or a particular printer, the Citrix Universal Printer can be mapped into a user’s session as a virtual printer that offloads the print job to the user’s client machine, using the native or third-party print driver installed on the client machine. Between these two wonderful gifts from Citrix, why even consider using a third-party print driver like the HP Universal Print Driver? Despite the stability and compatibility of the Citrix Universal Print Driver, I have found that even it sometimes causes the Windows print spooler to crash. I’m not saying that the driver itself is at fault. There could be a problem with the data an application is sending to the print subsystem and the Citrix UPD. Regardless, the print spooler sometimes crashes and has to be restarted to restore printing on the affected XenApp server. Option 1 is the most time-consuming and possibly the least rewarding because you may find that the problem actually is the driver, or an application that cannot be rewritten for whatever reason, or an OS patch that is absolutely necessary. Option 2, forcing users to use the Citrix Universal Printer, can potentially work marvelously for small print jobs provided the user understands how to use the Universal Printer options. Option 3, using native or third-party print drivers, makes many of us cringe. 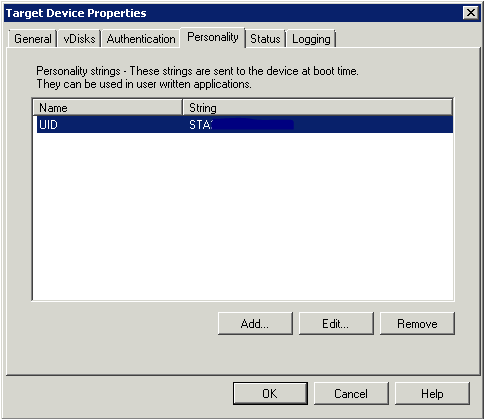 In Windows Server 2008 R2, some native HP drivers simply cannot be used. The native drivers HP gave to Microsoft to include in Windows included a bug which prevented the drivers from being used. This problem leaves the HP Universal Print Driver as the only native option for HP printers in Windows Server 2008 R2. If you have other printer brands in your environment, native drivers included with Windows will probably work. But remember that there is no guarantee that the native drivers will not crash the print spooler. So which option is best? As usual, it depends on your environment. Despite the issues, I propose that option 3 can be a good option for XenApp 6 environments where printing is not heavy. Allowing native and third-party print drivers in addition to the Citrix Universal Printer and the Citrix UPD offers the most flexibility. The biggest problem I have seen with using the HP Universal Print driver is that it can consume the entire CPU and render the server almost useless. If users in your XenApp environment are doing a lot of printing, don’t use the HP Universal Print driver. Don’t even install it. Otherwise, test it out and see how it holds up under your workload. If you decide to try third-party printer drivers, you don’t have to worry about these drivers crashing the print spooler thanks to the inclusion of a new feature in Windows Server 2008 R2 that allows print drivers to be isolated from the spooler. Print driver isolation works by creating a separate process, PrintIsolationHost.exe, for each session. Instead of a faulty driver crashing the spooler, it will only crash the PrintIsolationHost process, impacting only the user whose print job triggered the crash. Recovery is as simple as having the user log out and back in. The change takes effect immediately and no restart of the spooler is required. While print driver isolation is a valuable and much-needed feature, it is not compatible with all print drivers. And it is absolutely not compatible with the Citrix Universal Print driver! If there were a way to isolate it without breaking printing, it would save almost everyone from having to use native or third-party print drivers. Of course, isolating native and third-party drivers is only part of the solution. For maximum flexibility and compatibility, we need to automatically map the Citrix Univeral Printer into all user sessions, and set policies regarding the use of the Citrix UPD. Or we can allow the use of native or third-party print drivers, if present, and fallback to the Citrix UPD if native drivers are unavailable. The beauty of this configuration is that we can use Citrix policies to control when, if, and which print drivers are allowed without having to make any modifications to the XenApp server itself. Native and third-party print drivers are installed and isolated, but we can choose to disallow them by simply modifying the Citrix user policies. If the Citrix UPD causes problems with the print spooler, we can switch over to native and third-party drivers by simply changing the policies. And as if that weren’t enough, the Citrix policies can be filtered on a per-user basis. This means one group of users can be forced to use Citrix UPD, while another group can be permitted to use native drivers! Now you can see why I chose this configuration to provide the most control and flexibility without sacrificing stability of the XenApp environment. Earlier I mentioned that the Citrix Universal Printer is useful for small print jobs when the user understands how to use it. Rendering larger print jobs through the Universal Printer is extremely slow, and if users are trained in its use they can end up unintentionally printing to the wrong printer. Also, the Citrix Universal Printer requires the appropriate print drivers be installed on the user’s client machine, making its universal use a potential administrative nightmare. In the future I hope to see some intelligence built into XenApp and the ICA client that automatically detects and selects the best method of printing based on the user’s unique configuration. Citrix printing has improved tremendously over the years. One size still does not fit all, but we are getting there. Hopefully the Citrix Universal Print Server (Project Phaser) will be the silver bullet that solves printing in Citrix forever. The fix couldn’t be simpler. Just delete the value for ClientHostedApps in these locations, refresh your applications in Receiver, and you should be able to launch published applications. Deploying CAG with Web Interface 5.4 is actually very easy, there are just some “gotchas” that you have to be ready for. This is a guide to help you avoid those snags and pitfalls that commonly occur with a CAG VPX and Web Interface integration. 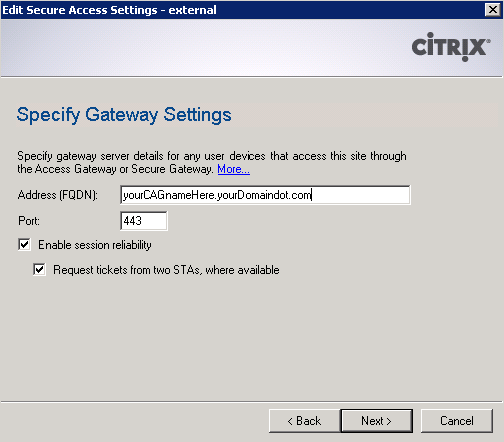 I recommend getting the Citrix Access Gateway VPX Getting Started Guide and HDX Remote Access Guide with Citrix Access Gateway VPX Express if you don’t already have them. The former document contains some inaccuracies but is has some useful reference info as well. The latter takes you through the fundamental setup of the CAG VPX and gets you to the web administration console, where most of the meaty configuration will take place. The CAG VPX will not reside in a DMZ. If your situation requires it to reside in a DMZ, setting it up is trivial once you’ve gotten everything else working. You have your web interface server setup, with no websites configured. Also, a word of warning: Configuring CAG VPX with Web Interface is like playing chess. Every move you make will affect all of your successive moves. In areas where I suspect your setup might require you to deviate from this guide, I’ll offer some pointers to help you make the right move. Let’s get started! First, follow the Getting Started guide to configure the management interface for the CAG via the VM console. If you are unsure about a setting, just take the default by hitting Enter. Once you have your management IP assigned, you’ll need to access the web administration console by browsing to https://[IP address]/lp/adminlogonpoint . Login with the default username and password “admin”. You’ll see a nice dashboard with two dials and some nasty looking red X’s. Click on the Management tab. This will take you to the Networking portion of the System Administration menu group. Here, enter the CAG’s hostname as an FQDN. You’ll see a list of your network interfaces (eth0, eth1, etc.) with one of them having the management IP address you assigned. To the right, there are four checkboxes labelled Internal, External, Appliance Failover, and Management. Moving from left to right, the interface that will be used to connect to your XenApp servers should have the Internal checkbox checked. The interface for management should already have the Management checkbox checked. The interface that will be receiving external requests from end users should have the External checkbox checked. If need be, your Internal and External interfaces can be the same. Make sure your DNS servers have an entry for your Internal IP! Under the Default Gateway section, select the interface the CAG should use to route traffic for subnets to which it is not directly connected. This will probably be your External interface. Remember, the CAG has a direct connection to the subnet your XenApp servers are on, so it doesn’t need a gateway to get to those. But it does need a gateway to get back to your external users who are connecting from the Internet! Click Save and restart the appliance using the big Restart button on the top right. Log back into the web administration console and browse to Management > Name Server Providers. Enter your DNS servers and DNS suffixes. Now go to Static Routes in the System Administration menu. Do you need a static route? If you plan on putting the CAG VPX into a DMZ later, go ahead and enter your static routes. Gateways you specify for static routes will take precedence over the default gateway you specified earlier. Remember, it does not hurt to add them now. NB: If the CAG is unable to retrieve the licenses, I recommend stopping and troubleshooting until it is able to successfully pick up the licenses. You can continue your configuration, but you will not be able to test it until the license issue is resolved. Moving right along, click on Authentication Profiles under the Access Control menu group. It’s time to add a RADIUS authentication profile! But before you do that, you have to set up a RADIUS server. 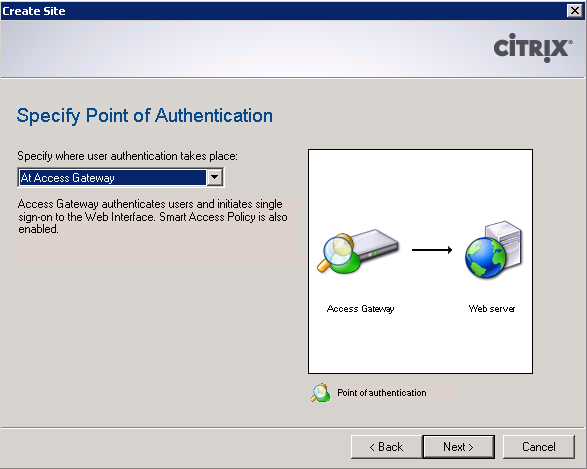 I recommend reading How to Configure Radius Authentication/Authorization on Windows 2008 for Use on Citrix Access Gateway Standard Edition. (One caveat, however: don’t perform steps 13-17 in the KB article because they’re unnecessary and will cause problems.) Click Add and enter a name for the Authentication Profile. Click New and add your RADIUS server(s) and shared secret. Leave everything under Group Authorization as-is. You’re relying on the RADIUS server to check group authorization. Now go to XenApp or XenDesktop under Applications and Desktops and enter the IP ranges of clients that can access XenApp servers via ICA and CGP. I really don’t know why there isn’t a checkbox that allows you the equivalent of a “permit ip all”, but there isn’t. Next, click Secure Ticket Authority. These settings are arguably the most common cause of application launch issues. Select your STA servers carefully, and make sure all your XenApp servers have unique STA ID’s! If you are running Provisioning Services and streaming XenApp, read before proceeding. Once you are sure your STA IDs are unique, click New and enter the FQDN of each XenApp server that will be providing STA services. By default, the connection type is Secure, but I’m guessing your XenApp servers are not using SSL for STA traffic, so select Unsecure. Leave everything else as-is and click Add. Note the servers you selected here, because you will need them later. At this point you can go ahead and restart the CAG VPX appliance, because it’s now time to do some work on the Web Interface (WI) side. Log into your WI server, launch the Citrix Web Interface Management console, and create a new site. Should we do the easy one or the hard one first? Trick question. They’re both easy! We’ll set up a site to be used with RADIUS authentication. Click Create Site under the Actions pane on the right, name the website however you wish and click Next. 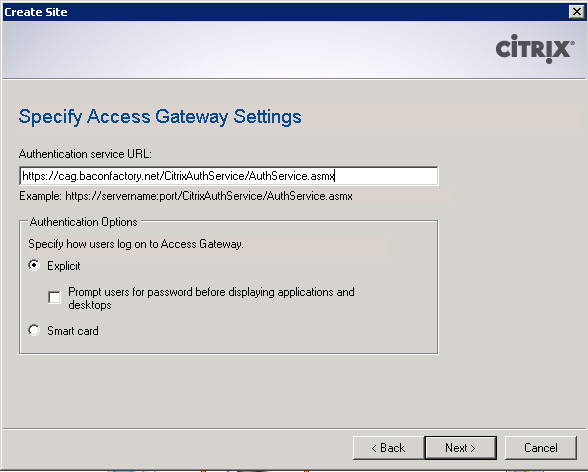 Select “At Access Gateway” as the point of authentication and click Next. Here you’ll be greeted with an intimidating looking Authentication Service URL field. But as I said, this is easy! 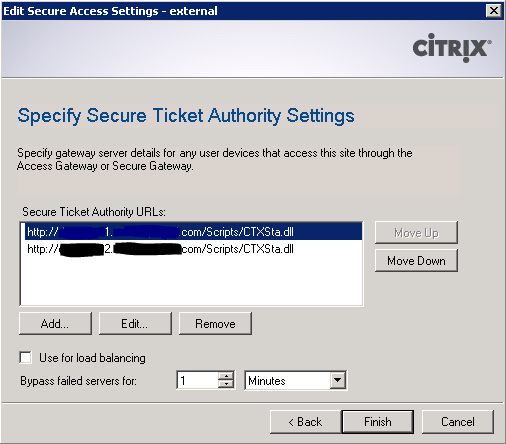 Just enter https://[cag-FQDN]/CitrixAuthService/AuthService.asmx and click Next, Next. After a few moments, your site will be created. Right-click the site in the XenApp Web Sites list and select Server Farms. Configure your XenApp servers like you normally would in WI. There is nothing here unique to CAG. Now right-click the site again and select Secure Access. Select the only item in the list and click Edit. 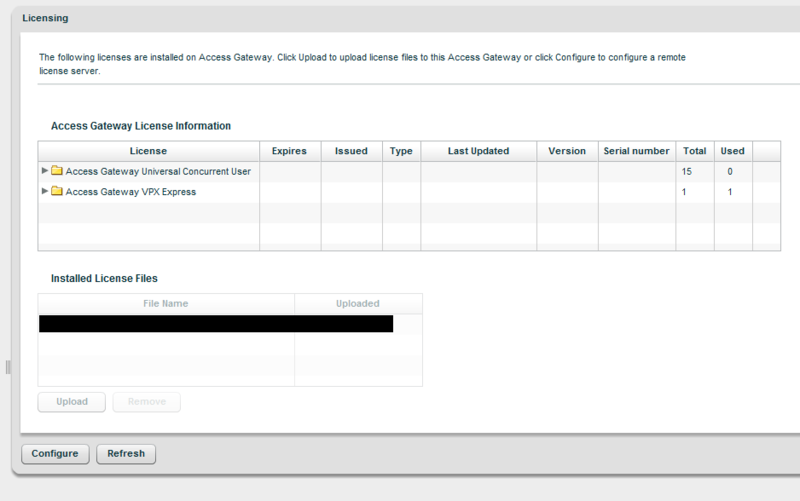 Change Access method to Gateway direct and click Next. Next you’ll be asked for the address of the CAG. Enter the FQDN of the CAG, and optionally enable or disable session reliability. If enabled, you can request tickets from two STAs (A word on this option: When you setup a site for Citrix Receiver, this checkbox must be unchecked. This site you are creating now cannot be used for Receiver, so don’t worry about it here if you plan to use Receiver.) Click Next. I still do not know why it doesn’t just ask for the FQDN and assume the rest like the CAG does, but that’s how it is. Do this for all STA servers you entered into the CAG, and in the same order. Check, double check, and triple check the URLs! Also optionally change the “Bypass failed servers for” option to 1 minute. Click Finish. Are we done? Almost. The CAG should be back up now, so log back into it. Click Logon Points under Access Control and click New. Now don’t be intimidated by all the settings. We only care about four things here. Enter the name of the logon point. Select this name carefully because it is what users will have to type in to connect to the CAG. If you enter “cag-logonpoint1” then users will have to go to https://yourcag.yourdomain.com/lp/cag-logonpoint1 which just looks ugly! Under Type select Basic. In the Web Interface field, enter the URL of the web interface site you created (no trailing slash). 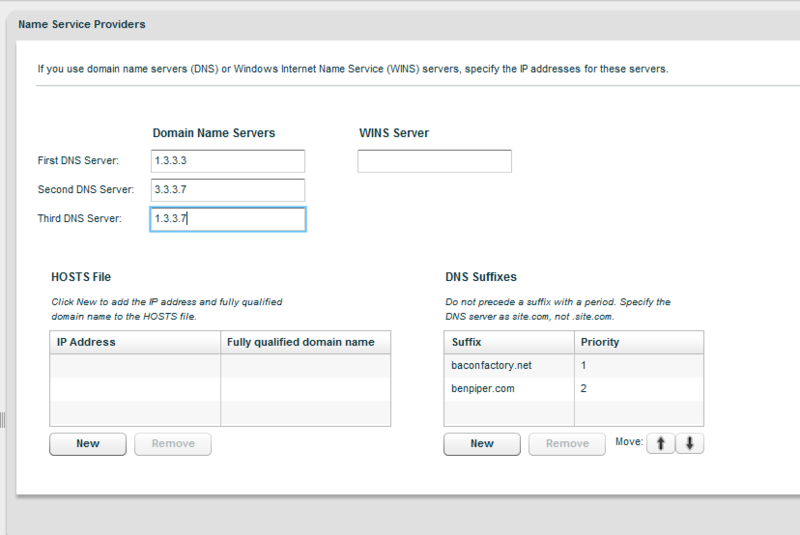 Under Authentication Profiles, select the RADIUS authentication profile you created earlier. Finally, check the “Single sign-on to web interface” check box and click Save. Now, we are almost ready to test. 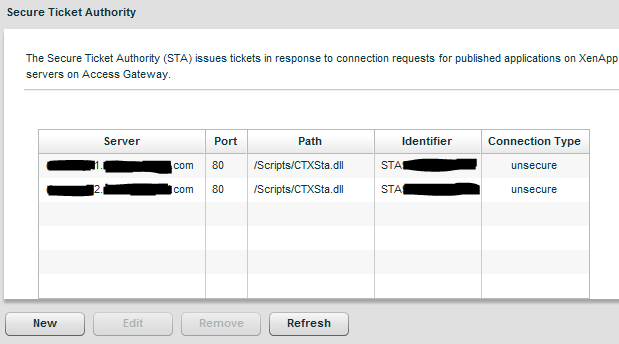 But to save ourselves from a disappointing moment of temporary CAG dysfunction, click on Secure Ticket Authority again. Do you see unique STA IDs populated next to each of your XenApp servers? If not, troubleshoot until you do. If so, it’s time to test! Browse to the logonpoint you just created. If you named your logonpoint “test1” and your CAG’s FQDN is yourcag.yourdomain.com, browse to https://yourcag.yourdomain.com/lp/test1. Do you get an SSL certificate error? Probably so. I intentionally did not cover installing a certificate because it introduces another level of complexity into the configuration. SSL Certificates are dependent on the hostname, and the hostname you use to connect to the CAG to enumerate and launch apps has to match up with the hostname on the SSL certificate. The certificate also must be signed by a trusted certificate authority. Unless you have your own certificate authority, getting a signed certificate can be a pain. Unfortunately, connecting to CAGs using untrusted SSL certs causes a lot of problems. You may encounter some of these problems or you may not. Test anyway. If you do run into problems, the good news is that the heavy lifting of configuring the CAG is done. Now, it’s time for a moment of truth. Once you’ve gotten a login prompt, log in with an AD account that has appropriate authorization. You may need to specify the user in UPN or down-level domain format. It depends on your AD environment, but one of those should work. If you have trouble authenticating, first check the logs on the RADIUS server to make sure the denial is not occurring there. If you continue to have issues, it’s time to get acquainted with what will become your new best friend: the CAG debug log. The CAG debug log is at your service at https://yourcag.yourdomain.com/admin/d/?req=DebugLog . Watch it for any FLEXnet or STA errors.